An Alphasmart is a digital typewriter that was designed to help teach keyboarding to grade school children in the public school system. The Alphasmart has a full-sized keyboard, is portable, lightweight and built to take a beating. It has no internet connection. It stores the keystrokes the student makes in file buffers that can later be uploaded either to a computer via a cable or to a central unit in a classroom setting. Since the children can not access the internet, they learn to write without distraction and pick up keyboarding speed with ease. The last few years, the Alphasmart has been phased out of the school systems in favor of tablets and chromebooks (a limited laptop). Many of these tough old alphasmarts now flood eBay for a low price. For $20, you can have a self-contained writing machine with a full-sized keyboard and a small screen interface that will not get between you and your writing. 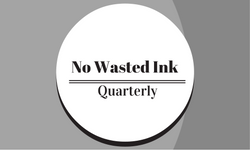 I personally use an Alphasmart Neo as my drafting machine of choice, but I started out on an Alphasmart 3000 and found it more than up to the task of writing a novel. There are three main model types of Alphasmart to choose from. Which one is right for you may not be readily apparent. Below I am going to make a comparison of the three models going over their strengths and weaknesses. I know writers that use any of these three models, so once you know the differences, you should be able to determine which is the right one for you. The Neo is known for the sharp lettering on its LED screen and can be seen in bright sunlight when you write outside. The lines that are shown are adjustable via the alphasmart manager program. It ranges from 4 to 7 lines. I have mine set at 5 lines because I like the text to be a little larger. You will need a book light to use with your Neo when writing at night. I always bring my Mightybrite dual music stand light with me to the coffeehouse when I write with it. The Neo has eight compartments for your writing, each will hold approximately twenty-five pages of text. 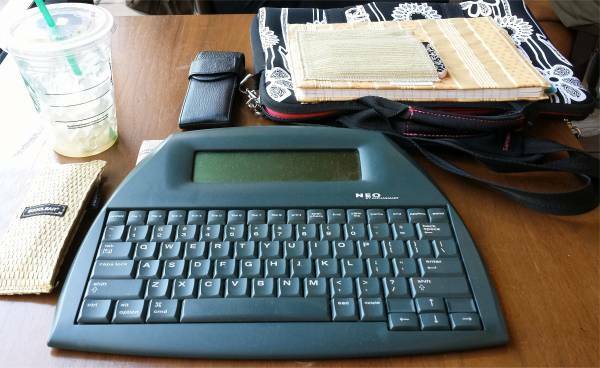 The Neo comes with a built-in thesaurus, dictionary, and word count feature. Having an instant word count on the go has been a real asset to me during Nanowrimo when keeping track of your word count is critical to keeping up the pace of your drafting. Battery life on the Neo is fantastic. It takes 3 AA batteries and this will keep your Neo running for 700 hours. I change out mine once a year and my machine is ready for instant writing at any time. I never need to hunt for an outlet when I’m out writing in coffeehouses and I can take my Neo to the park or into my backyard for outside writing. There is no internet connection for the Neo. This makes it an excellent non-distraction machine to use for your writing. I do bring my smartphone with me when I write so in the event I do need to look up something on the internet on the fly, I can do so, but the extra effort this takes usually keeps me from doing the act. I view this as a positive thing. When new writers are looking over the Alphasmart line, many gravitate to the Dana. It has a slot for an SD card, has a word processor, and a larger screen to see your work. However, there are problems associated with the Dana that you need to be aware of. First off, the palm based word processor that you can use with the Dana is no longer supported. Even if you found a free download of the program, the license keys are gone. If you have a license key from the past, you can use the word processor, but if you are a new user, you are out of luck. You can upload any palm based software into the Dana and find it compatible, but frankly, if that is your goal, I think you are better off with an inexpensive laptop or tablet. The Dana does not have the ability to save every keystroke the way the Neo does, it stores the data on the SD card. There will be times when you will lose all your text. The screen on the Dana is larger, but it is fainter and harder to see the text. Some people have gone as far as remove the over screen on their machines in order to make the screen more readable, but this is difficult to accomplish if you don’t have the technical skills. 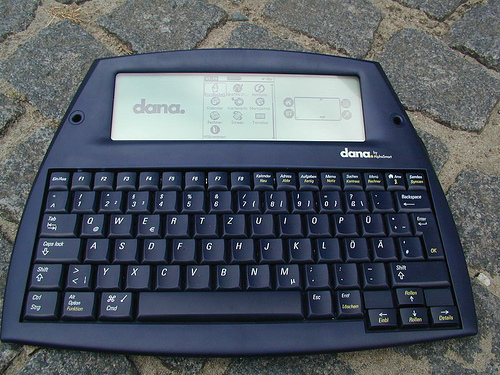 Like the Neo, the Dana does have the standard simple word processor, dictionary, thesaurus, and word count features. However, it does not have the battery life. Your Dana will last only a few hours on a charge, similar to a laptop. 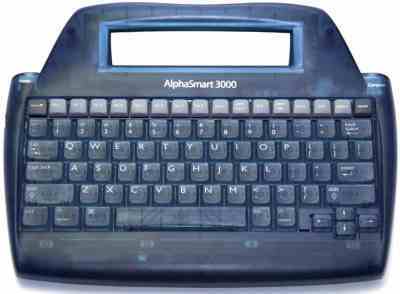 My first Alphasmart was the 3000. It has a solid, full-sized keyboard with a good feel. My typing speed is fast on the machine and the screen has sharp, crisp lettering. The standard eight files in the AS3T only hold around 8 pages each, so when writing on it, I recommend “sending” your data to your computer each night and freeing up your space when you can. It is good to get into this habit anyway so that you store your data in a safe place. While the AS3T is a rugged machine that stores every keystroke, I feel better seeing my work in my Scrivener program on my desktop. The desktop manager does not have a word count feature in the AS3T. It only has a simple word processor, dictionary, and thesaurus. The AS3T uses three AA batteries and has the same 700 hours of run time as the Neo. You pop your batteries in once a year and then don’t worry about it. The AS3T is a little more square and longer than the Neo and I find it harder to perch on my lap, but if you have a tabletop to write on, you should be fine. 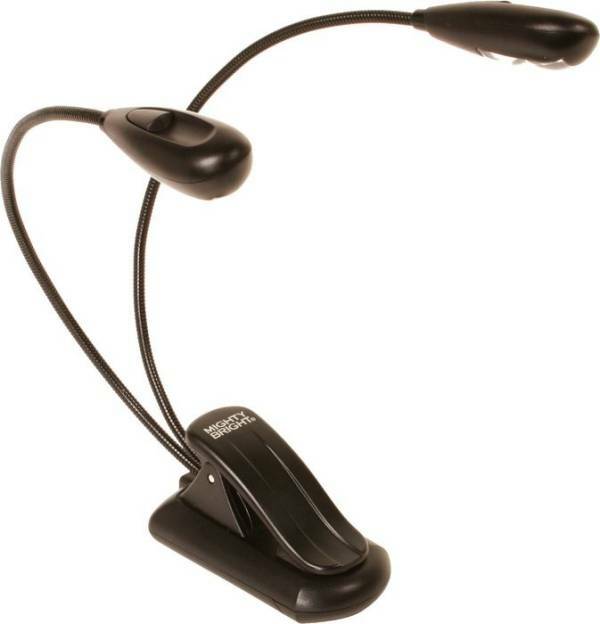 The AS3T also will need a book lamp to light up the keys and screen when writing at night or in a dim coffeehouse. Of the three machines, I feel that the Neo is the best choice for an author. The keyboard is the most ergonomic, the screen is the sharpest and easiest to read and it holds more data. The word count feature is a real plus too. Being able to turn on the machine and start writing in around two seconds is a real plus. My second choice is the Alphasmart 3000. While it doesn’t store as much data as the Neo and the keyboard is slightly less comfortable, it is a solid and dependable machine. I own one as a backup and will not part with it. Finally, I feel that I should give a word of warning about the Dana. While I do know of people that own and prefer them, I feel that due to their age and that much of their palm OS software is difficult to come by, makes the Dana a poor choice. Spare yourself the headache and look at the Neo or AS3T. Every October I prepare for National Novel Writing Month. Nanowrimo promotes the act of writing 50K words toward the rough draft of a novel. 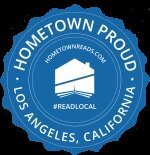 People join together all over the world to support their fellow writers and to help all of us cross the finish line toward success. Most of the writers of Nanowrimo are beginners. The participation in Nanowrimo can be a submergence learning experience where new ideas, techniques, and tools are all explored at a rapid rate to get the beginner writer off in the right direction. Although I am now a published writer, I still look forward to Nanowrimo because it gives me that huge energy boost and camaraderie that keeps me going on a new project. One of the main things that I do to prepare for the event is to put together a writing kit. It allows me to participate in the local write-ins that take place at various hotel lobbies, coffeehouses, and libraries. Every writer has a unique kit that they assemble to aid them in the writing process. I start out my writing kit with a designated bag. I will keep this bag packed with all my writing gear at all times. It allows me to pick up the bag and go on a moment’s notice. I know that everything I will need will be available in the bag. I’ve used everything from a grocery sack to a cloth tote bag. My current writing kit bag is a Solo Laptop Tote. It looks like leather and is stylish, but not extremely expensive or heavy. It is large enough to hold all my gear and offers my electronic devices a bit of padded protection. Any laptop bag or backpack should work for this purpose. Next, I pack in my Alphasmart Neo. I prefer the Alphasmart to a laptop for drafting. An Alphasmart has been my go to device for Nanowrimo for the past four years. I started with a $30 Alphasmart 3000 for my first Nanowrimo write-ins because at the time I could not afford a laptop computer. The AS3K has a run time of 700 hours on 3 AA batteries. Basically, I pop in the batteries and I’m good to go for the year. The screen is LCD and easy on the eyes, unlike bright computer screens or tablets, and it has no Internet capability. Unless I deliberately turn on a device to access the Internet, such as my cell phone, I am not distracted by Facebook or other on-line time wasters. I credit the AS3K for helping me reach my 50K word goal for the first time. The following year, I upgraded to the Alphasmart Neo. The Neo has a more ergonomic keyboard, the 8 built in files can hold more data and the screen is somewhat bigger than the AS3K. I find that my typing speed is faster on the Neo. It makes a great keyboard for computers and tablets, needing only an USB connection to operate. 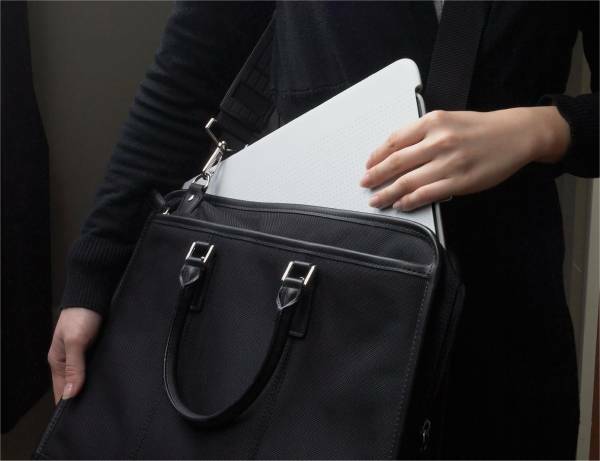 The Neo is about the size of a small Mac Air laptop, but is much lighter in weight and far more durable. I store the Neo in the laptop portion of my bag and I bring along a few accessories to go with it. I keep my USB printer cable in the bag, it is the way that my Neo accesses my computer at home. I use it to upload my writing at the end of each coffeehouse session. I also have a Mighty Brite Duet light system that I clip to my Neo in dark situations or to write at night when I’m camping. The Mighty Brite has two LED lights that can light up my keyboard evenly. It was originally designed to be a music stand light for musicians, but many Neo owners equip their digital typewriters with this light because the clip is strong enough to grip the back of the Neo’s housing. Finally, I bring along a rubberized lap board. It provides a grippy place to perch my Neo if I’m writing on my lap or gives a more stable surface for my device when writing on a table. The Neo never gets hot, but the bottom is a little slick. The board keeps my Neo from sliding off my lap. The board I use is a Logitech Portable Lapdesk. I bring several paper bound books with me. First is a composition notebook with the outline, character sketches and other notes for my novel. With it I have a pouch with a fountain pen and a Coleto Mult-pen for color coding. Perhaps it is old-fashioned, but I find that when I’m brainstorming new ideas, I do it better on paper. I index the front of my notebook so that I can easily find the sections inside where my notes are and I always have blank pages available for writing down new ideas on the fly. The other two books I bring are a Pocket Webster’s Dictionary and a Pocket Thesaurus. I like having the means to look up words without having to rely on electricity or wifi access in a pinch. The final device I like to bring is my iPod Touch with earbuds. Usually, the general din of the coffeehouse is fine as background noise, but sometimes the PA system is not playing something that I find pleasing. When you put on earbuds or headphones, people also take this as a signal that you do not wish to chat and you can carve out more writing time for yourself that way. My iPod Touch is set up with several apps that I use for research, including a dictionary, thesaurus and an app called Lists for Writers. I also carry a cell phone, but I tend to not bring it out unless absolutely necessary because it is too easy to pull out a game or to read Facebook when I do so. All writers have unique items that they like to bring to write-ins during Nanowrimo. The key is to keep all the items in a single, portable, bag and only bring what is necessary to promote good writing habits while you are away from home. 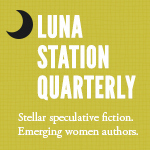 Do keep in mind that local write-ins are a great place to talk about writing and gain advice from your fellow writers. Do not close yourself up completely when you attend a write-in. 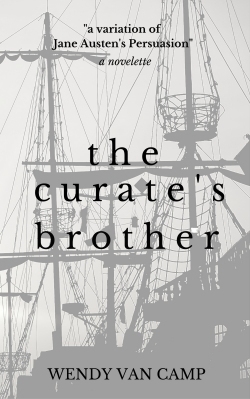 Most of the habits that I have as a writer were learned as a Nanowrimo participant. Open yourself up to the information available during the November writing push and most of all, have fun! In the year 2010, I was facing the fourth year that I was to attempt National Novel Writing Month or as it is affectionately known, NaNoWriMo. The goal of writing 50,000 words in a single month is a daunting task, but I knew if I wanted to become a novelist, it was a skill that I needed to learn. For my fourth attempt I needed to make a change in the way that I wrote, otherwise I feared that I would fail again. My main problem was not being able to write away from home where my desktop remained. I work on the road for many days in November and I always lost far too much time in my hotel room stays. On the forums of the NaNoWriMo website, there were recommendations for an Alphasmart 3000 and the Alphasmart Neo to use instead of a laptop. These were writing tools that were designed for young students to write compositions in the classroom. I had never seen one before, but I was intrigued. I could take one of these with me on the road and do my writing and then use the “send” feature to upload my work into whatever word processor I was using. Learning that an Alphasmart 3000 was around $30 on eBay, I was sold. I did not want to invest in an expensive laptop only to discover that I did not enjoy writing away from home. In October 2010, my AS3K arrived in the mail. The device was a transparent teal with grey keys and had a small window for digital text. I was not sure if I liked having such a tiny window as I worked, but since this was an experiment, I was willing to give it a try. I did not bother to buy the AS3K a protective sleeve. I simply tossed it into a cloth tote bag along with my pocket thesaurus. It was rugged enough to hold up to such abuse. When I went to my first write-in, I was amused by the number of people that stopped to ask me what I was writing on because they had never seen one. Due to the small screen size, I was not certain if I would like writing on the Alphasmart, but became a convert to it. The screen is 4 lines high and 40 characters in length. The LCD screen has a high contrast and is easy to read. Since I am able to scroll up and down and do minor editing, I am able to keep my train of thought as I wrote, leaving the main editing to my desktop at home. During the write-in, I was not distracted by websurfing as the writers with netbooks or laptops were, all my time was funneled toward the written word. At the end of the evening, I discovered that the final word count of my project was much higher due to this. I also liked that I did not have to fight for a chair near a power outlet as the other writers did. My Alphasmart 3000 has all the power it needs. The biggest surprise was the satisfying click of the full sized keyboard that reminded me of the old-fashioned typewriter that I had back when I was kid. It was a joy to write on compared to the soft keyboards of more modern computers. After the write-in, I was able to come home and upload the text into my computer via a USB cable. The only drawback to the unit was that it did not have a word count feature and the word processing software is somewhat primitive. I was able to conquer NaNoWriMo for the first time in 2010 and I credit this success to the acquisition of my Alphasmart 3000. It became my main writing machine when I was away from home for two years. I like the Alphasmarts for rough draft work. The small screen size helps prevent your inner editor from interrupting the flow of your writing and you get more words down that way. Later, in revision, I work in Scrivener on my desktop. 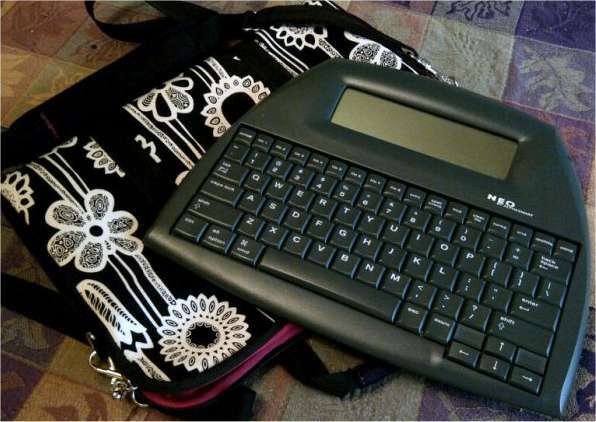 Late in 2011, I decided to upgrade to the Alphasmart Neo and it is the machine that I use for my rough drafting today. The Neo has a slightly more comfortable keyboard, a screen that can hold up to 9 lines of text and it can hold more text. The word processing software is better and it has spell check, a thesaurus and a word count feature. If you are a new writer in search of an inexpensive machine to use for NaNoWriMo, I recommend that you look into the Alphasmart 3000 as your first writing tool. Get a feel for the keys and the non-distraction writing format and you will never look back.